Visit Carcassonne, the city of two UNESCO rankings (medieval city and Canal du Midi) and the department of Aude since a very nice studio bungalow. It consists of a large south facing room (large window overlooking large terraces), with kitchen and bathroom apart. You will be able to eat outside, possibly shelter. This 35sqm apartment is tucked away in a large flower and beautifully wooded land located 9 km from Carcassonne. Bicycles are available. You will remain a few hundred meters from a lovely village (trade, mail, tennis) with stunning views of Black Mountain and the Pyrenees. Close to the Cathar castles, giant Cabrespine and village of the book (Montolieu) you will not miss exits opportunities. The apartment is particularly well oriented: morning, the trees keeps the sweetness of the night. From noon daylight roof protects from the sun and keeps the temperate house. A large covered terrace offers a privileged space for dining, reading or lounging. The pool faces the studio and you will be practically reserved (we're just two). Solar shower, sun loungers are available. You can park right next to the house in a reserved area. The place is very quiet and pleasant. By pursuing the path of Aragon small winding road will lead you to the foothills of the Black Mountains and the picturesque village of Aragon. Several so-called Cathar castles (Lastours, Saissac ...) and abbeys (Villelongue Caunes Minervois ...) are less than a quarter of an hour. We do our best to inform tenants and allow them to spend a relaxing and memorable. Quiet, studio/cottage convenient to Carcassonne. The studio/cottage is tucked away in the beautiful grounds of Norbert and Monique’s home. Our hosts were very pleasant and hospitable without being intrusive. 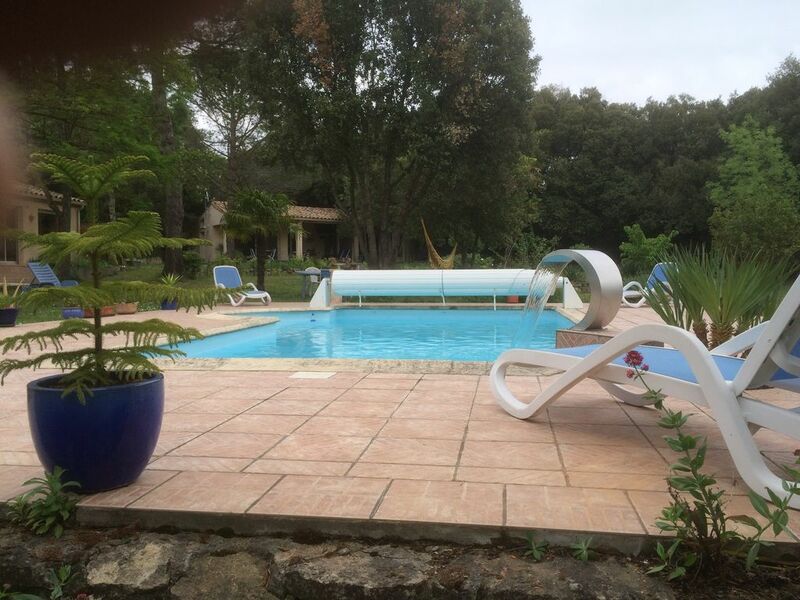 We had use of the pool at any time plus the use of the bicycles on site- great for cycling along the Canal du Midi. We hired a car from Carcassonne airport and went touring most days, guided by Norbert and Monique’s excellent local knowledge. The cottage is compact but spacious enough for 2 people comfortably and is clean and well equipped, with nice outdoor area as well. A car is necessary for getting around as there is very little public transport in this area, but the roads are good and very quiet in the rural areas. There are lots of interesting places to visit. A lovely, relaxing week and good weather as well. Nous sommes toujours heureux de faire partager la richesse patrimoniale de notre région. Nous apprécions également que nos visiteurs passent de bonnes vacances et soient satisfaits du cadre que nous leur proposons. Appartement calme très bien placé pour des sorties autour et dans Carcassonne. Très bonne semaine à Ventenac où nous avons reçu à accueil chaleureux de notre hôte. Tout est fait pour que l'on se sente comme à la maison. Merci encore pour votre gentillesse. We are 9 km from the city center of Carcassonne and the airport.